On their latest single Saw Myself, Perth four-piece Foreign Architects deliver weighty, contemplative lyrics on a joyride through gentle, uplifting melodies. 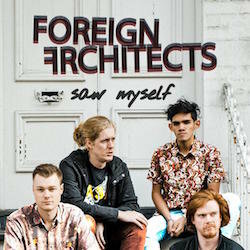 Saw Myself is the second single from Foreign Architects' forthcoming EP, following on from the irresistibly catchy Talk To A Scientist. Written amidst pure tumultuousness though, Saw Myself is a different animal to its predecessor. Within the space of a handful of weeks, singer Matt Burke had lost a family member, wound up in a city gripped by terrorist attacks and faced a painful breakup. Born of the ashes of these events, Saw Myself is about reflection, honesty and perspective. Still, in spite of the emotional fuel behind its meaning, Saw Myself is yet another example of loveable, hook-laden indie rock from a band whose skills grow exponentially with each new release. Recorded by Dylan Olivierre (The Money War) and mixed by Andy Lawson (Eskimo Joe, Tired Lion, Gyroscope) Saw Myself captures the perfect balance between the delicate tones of the band and the power of their live sound. Saw Myself was written amidst pure tumultuousness - within the space of weeks, singer Matt Burke had lost a family member, wound up in a city gripped by terrorist attacks and faced a painful breakup. Born of the ashes of these events, Saw Myself is about reflection, honesty and perspective.